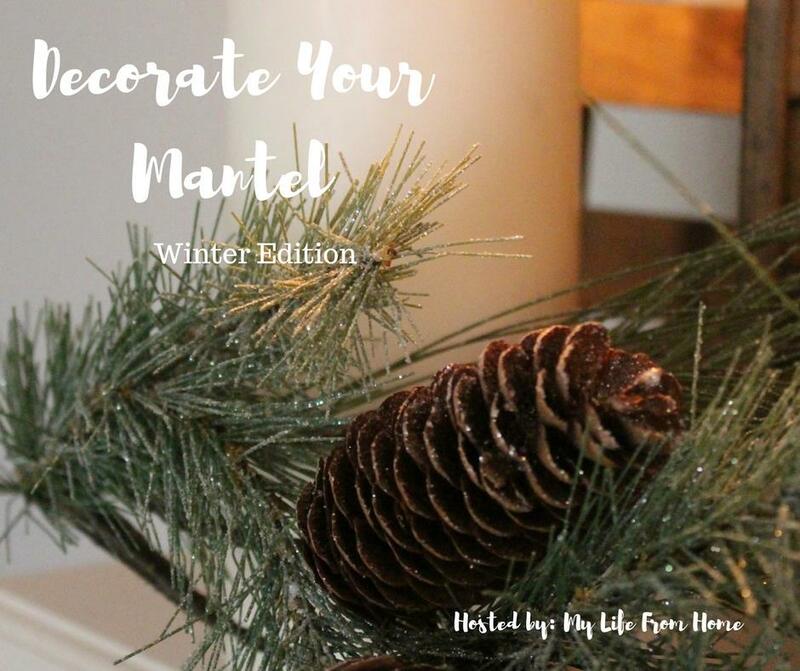 We are back with Decorate Your Mantel Winter Edition. A big thank you to Amy of My Life From Home for hosting this fun blog hop. If you’ve visited here before you know I love to decorate my Mantel for all seasons, so I really look forward to this Mantel Hop. Once all the Christmas decorations were put away, the living room really felt like a breath of fresh air. It seemed a lot less cluttered and I really wanted to keep things light and simple for my Winter Mantel. 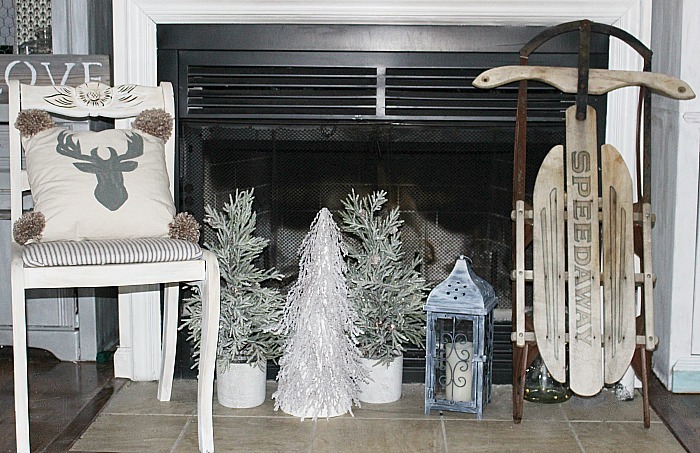 I was able to transition quite a bit of my Christmas decor into my Winter Decor like the large bottle brush trees that were a new addition this year from Oriental Trading . They have a snowy look to them that really fit in nicely with my neutral Mantel. 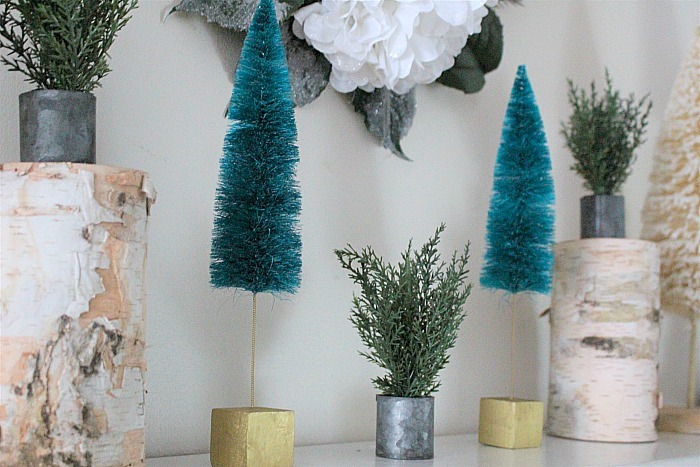 The second I spotted the vibrant blue bottle brush trees on clearance I knew they would be the perfect pop of color for my Winter Mantel! The natural look of the Birch Bark Pillars add to the rustic farmhouse look that I love! You can see the quick and easy tutorial for the Embroidery Hoop Wreath here. For the hearth I gathered large snowy trees next to an antique sled that I scored for $5 at a yard sale last year-score! I received a Pompom Maker for Christmas and boy do I love this thing! Warning-it is very addicting. See how I made the Pom Pom Deer Pillow here. While I was at it I decided to make a Pom Pom banner for the mantel sticking with the soft neutral colors. Well that’s pretty much it. 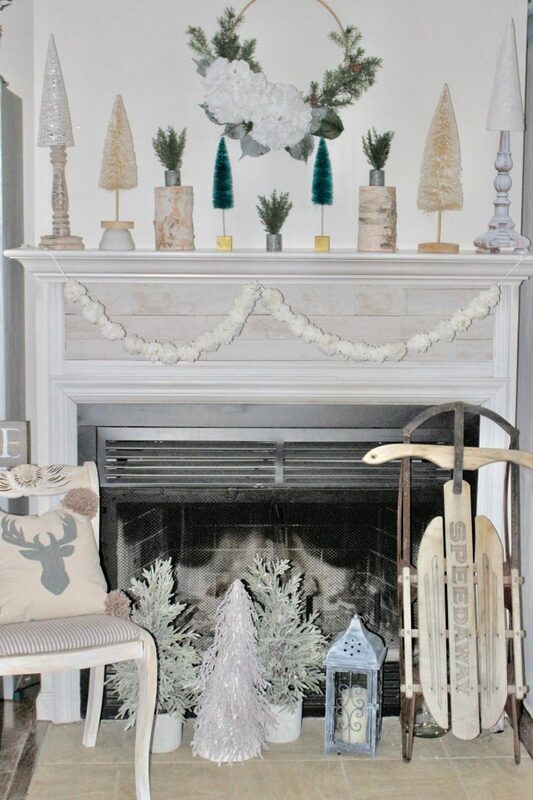 Just a few snowy trees, a sled and a Pom Pom banner and you have a warm and cozy winter Mantel-especially when there is a fire burning. 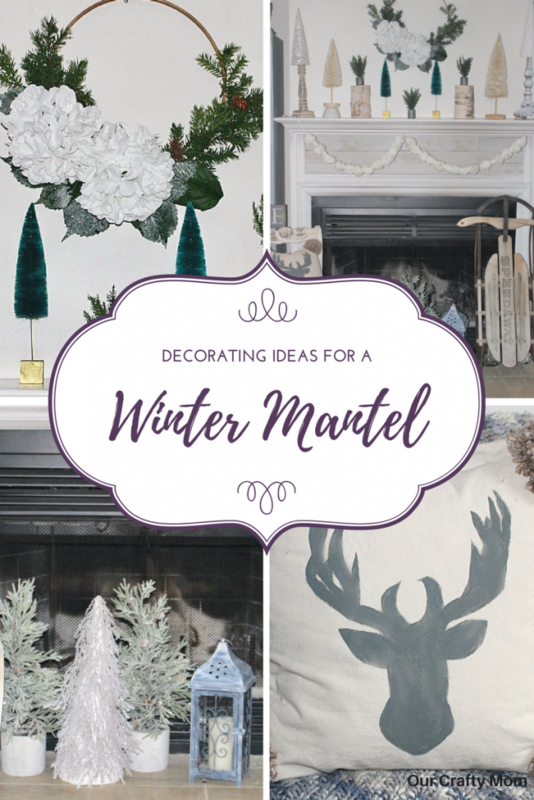 Hop on over to see the rest of the winter mantels. I’ve seen a sneak peek and you are going to love them! Hey Michelle – we can’t get enough of the bottlebrush trees! Love the look of them and the color variations. 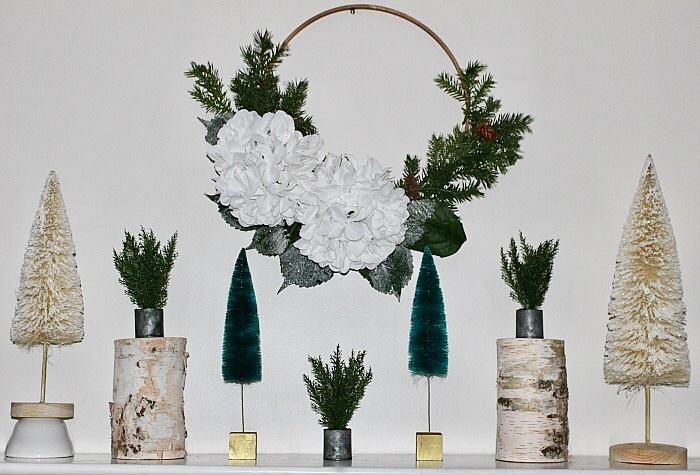 The look great paired with birch…such a smart idea for winter decor! Thanks so much! I love that they can stay out all Season! the birch and the brush trees give me so many hearts in my eyes! love this setup!! I love the combo of the birch candles and bottlebrush trees. Your mantel is so warm and cozy, perfect for the season! Thanks Amy. I was so happy to find those blue bottle brush trees! So many pretty trees! And I just love that vintage sled! Love your collection of bottle brush trees and they look so lovely on your mantel!! I can’t believe you got that sled for $5! What a find!! Your mantel looks great, Michelle! Your mantle is lovely! I love the simplicity of it. 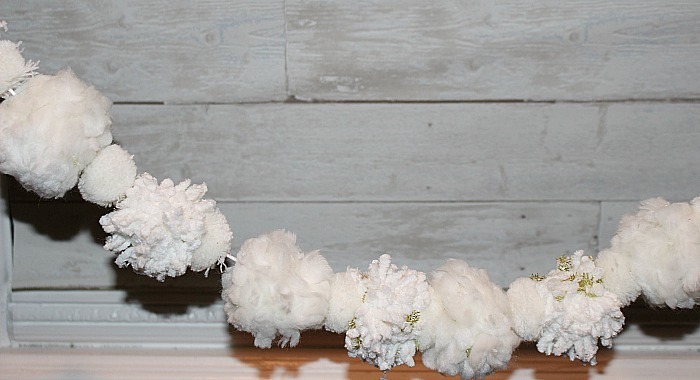 The pompom garland is a perfect addition. I think I need one of those! Thank you for sharing you home decor ideas on Party in Your PJ’s. I’ve pinned to my Home Ideas board.